Burberry Off Shoulder Dress Size 4. Navy blue with belt. Condition is Pre-Owned. Sent with Australia Post Pre-Paid Parcel Post Satchel 500g. Size UK 10 / US 8 / IT 42. Size: UK6 US4 IT38. Burberry paper carry bag will be included if you choose cash on pick up. Authentic BURBERRY Ivory Floral Lace Dress. Lining: 100% Silk. Outer Fabric: 75% Cotton 25% Polyester. Up for sale is this gorgeous grey velvety dress from Burberry size 12 month. There is two parts, on the chest and at the back of the dress that got a bit pulled out because of stickers otherwise it’s a great used condition that just need washing. Bought it at a high normal price so grab the bargain From a free pet house Feel free to ask..and please check my other listings, I have lots of great clothings to see Thanks! Brand New Burberry Dress. Size UK6, bust 40cm. 100% Silk. a little tiny fault around the zipper. Doesn't affect wearing.Condition is New with tags. Sent with Australia Post Pre-Paid Parcel Post Satchel 500g. The fit was towards a skinny fit, nicely cut, and the fabrics holds a very nice shape. This can been worn as a dress, or wear it on top of a thin outfit, as an outerwear. Up for sale here is BNWT Burberry trench-style dress/outerwear with 3/4 sleeve. 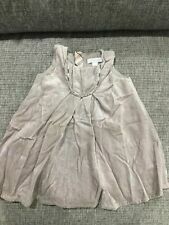 BURBERRY silver Dress NEW Size EU48/US14. Condition is New with tags. Sent with Australia Post Pre-Paid Parcel Post Satchel 500g. Burberry Shirt Dress with contrast piping. Can be worn as a dress or light jacket with jeans and a t-shirt. Item has never been worn, purchased end last year. RRP $990 but selling for $400. Can provide more photos if requested. Burberry authentic khaki dress size 8. Condition is Pre-Owned. Sent with Australia Post Pre-Paid Parcel Post Satchel 500g. Exquisite all-over lace with floral pattern in round neckline, short sleeves, fitted at the waist with back slit to the calf in a sophisticated dark wine red. Concealed back zip closure with hook clasp at the neck. Colour: Boysenberry. Size: 6 UK. Pattern: Plain. Characteristics: Color: Black Silver. Jacket Vents Take a look to find your new favorite. We are happy to help and advise you. We do not use manufacturer photos and strive to every detail on our product pictures to be presented. BURBERRY LADIES SHORT SLEEVE POLO DRESS. FROM THE BURBERRY BRITT COLLECTION. ARM PIT TO ARM PIT ACROSS FRONT (BUST) - APPROX 47CM. ACROSS BACK - ARM PIT TO ARM PIT APPROX 47CM. SHORT SLEEVE - COLLARED - SLIGHT V NECK OPEN FRONT. Presented here is this Authentic New Burberry Black Zahramf Ruffle Lace Dress, Size 10. This is a Burberry 10. Inverted front pleat. Short sleeves with double ruffle trim. Playful ruffles trim the shoulders of this beautifully tailored lace A-line dress, adding romance, style and fashion to the elegant silhouette. Gorgeous Burberry Trench Dress! Completely new with tags. Bought in Dubai hence the AED currency. Unfortunately a size too small for me (fits size 8/ small 10). Was 1000$, bought for 500$ & I am selling it for 150$ shipping excluded. Meet up in Brisbane CBD is an option. 100% Authentic Burberry. Occasion: Formal. Style: Shirt Dress. Good Condition- Minor stains. Small Spot stain front near buttons. Great new wardrobe addition at a great bargain price! Zipper: None |. This model is very hard to find. I only have 1. Style Tunic. Color Olive Green, Ivory, Black. Color: Army Green. Sleeves from Shoulder seam: 19". Dress Length Above Knee, Mini. Pattern Plaids & Checks. Beautiful DRESS BY BURBERRY PRORSUM COLLECTION! Material Silk. Color Blue. Pits 18.5, length 41, sleeve length 24, waist 14. We always respond quickly. Super stylish and beautiful knee length dress from the brilliant designer Burberry. Clothes Shoes Handbags Accessories Electronics Support. Condition: 100% Silk. Minor signs of wear. This ensures that you are able to fully explore, and fall in love, with the gorgeous item you have chosen. Product Line BURBERY BRIT. comfy stretchy dress. Style Sheath. Neckline Scoop Neck. faux leather trim pocket. If unable to check out I will be happy to send you an invoice for your item. Picture(s) Color maybe slightly lighter or darker due to lighting. Model: KNIT CHECKED DRESS. Colour / Size: Off White x Brown x Red, 36. Length: 85 cm Sleeves: 45 cm. Shoulder: 36.5 cm Width: 34 cm. 100% AUTHENTIC. Model Number: N/A. S Nearly new. B Used a lot. Super stylish and exquisite midi dress from the brilliant designer Burberry. Clothes Shoes Handbags Accessories Electronics Support. This ensures that you are able to fully explore, and fall in love, with the gorgeous item you have chosen. This lovely corset inspired little black dress by Burberry features a sweetheart neckline, hook-and-eye closures down the front, and a flattering sheath silhouette. Pair it with black peep toe heels for a party! StyleA-Line Dress. OutsideS Good condition. InsideS Good condition. MaterialOutwear:Cotton100%. Product title. OutsideS good condition. Manufacturer: Burberry. Pattern: Plain. Jacket Vents Characteristics: Color: White Beige. Take a look to find your new favorite. We are happy to help and advise you. We do not use manufacturer photos and strive to every detail on our product pictures to be presented. 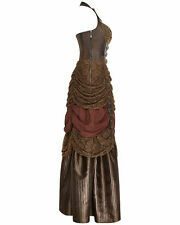 Zahralt Dress. This is the "Zahralt Dress". Style number - W:ZAHRALT:AASYV:00100. Burberry Brit. Short sleeve tweed dress by Burberry Brit. Dry clean only. Shade Gray. 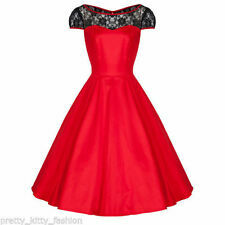 Style Dress. 7 (Cheap ??. unused item. It is one piece of Burberry. It is pretty design with Frill. Because it is a denim cute and casual. Although we try to reproduce loyalty faithfully. colors may differ depending on the model of the monitor. ). Utilitarian style of a crisp shirtdress with. Burberry Brit. Amanda Dress. This is the "Amanda Dress". Shade Military Green. NO BELT IS INCLUDED WITH DRESS. Color: Military Green. military inspired details. A super stylish and beautiful dress from the brilliant designer Burberry. Clothes Shoes Handbags Accessories Electronics Support. Condition: Used but in good condition with only minor signs of wear. Product details: Grey silk ruched mini dress by Burberry Prorsum. Sweetheart neckline. Exposed back zip closure. Center back hem vent. Label size IT 40. Material Silk. Size Type Regular. Super stylish and amazing cocktail dress from the brilliant designer Burberry. Clothes Shoes Handbags Accessories Electronics Support. This ensures that you are able to fully explore, and fall in love, with the gorgeous item you have chosen. Super stylish and beautiful knee length dress from the brilliant designer Burberry. Clothes Shoes Handbags Accessories Electronics Support. This ensures that you are able to fully explore, and fall in love, with the gorgeous item you have chosen. Super stylish and amazing evening dress from the brilliant designer Burberry. Clothes Shoes Handbags Accessories Electronics Support. This ensures that you are able to fully explore, and fall in love, with the gorgeous item you have chosen. It is "36 size" one piece of Burberry blue label. Although we try to reproduce faithfully. colors may vary depending on the model of the monitor. Classic popular elegant hose embroidery waist belt design is a point. Burberry's "Kids 110A size" dress. Although we try to reproduce faithfully. colors may vary depending on the model of the monitor. Knit material with warm feeling Elegant hose embroidery and stylish toggle buttons are the points. Unused item. Burberry ??. Blue Label BURBERRY BLUE LABEL Size 36 One Piece Popularity check pattern Opening the back of the trend Very fashionable design. Although we try to reproduce faithfully. colors may vary depending on the model of the monitor. Super stylish and beautiful evening dress from the brilliant designer Burberry. Clothes Shoes Handbags Accessories Electronics Support. This ensures that you are able to fully explore, and fall in love, with the gorgeous item you have chosen. • Berberry long sleeve sheath dress. Style Sheath Dress. Sleeve Length Long Sleeve. Dress Length Midi. Size Type Regular. • Size 10 US size 12 UK size 44 IT. Color Black. Known as one of the foremost names in fashion and luxury, Burberry clothing and accessories have grown from the shores of London to become a global powerhouse. This is perhaps most true when it comes to women's fashion, as the company has grown into a popular choice for girls and women of all ages, shapes and sizes. And Burberry can certainly help with one of the most vital parts of any female's wardrobe: a solid stable of dresses she can wear throughout the year. From short summer styles to longer elegant fashion fit for fancy events, eBay's online collection of Burberry dresses for women includes a range of looks to suit a variety of body types and favoured looks. Burberry short sleeve polo dresses for women provide cool and comfortable chic threads for the summer months. Throw one on before taking a stroll out in the sun, or show up to your next get together with the crew in one of these solid-coloured beauties and stay cool as the temperature rises. Black dresses are a staple in just about any woman's closet, a do-it-all piece of clothing that fits into all sorts of situations and occasions whether they be formal or casual. The collection of black Burberry dresses for women that you can buy online from eBay includes longer pieces that stretch down to the knees all the way up to shorter offerings that are optimal for the warmer weather months. Add in some Burberry women’s tops and blouses and you can revitalise your wardrobe and prepare yourself for whatever events and weather come your way with just a few clicks. Buy Burberry online from eBay today and add a splash of luxury to your look.